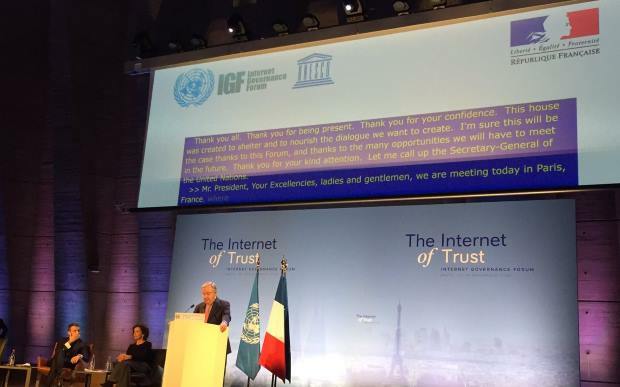 The document was issued by the host country at the opening today of the 13th annual meeting of the Internet Governance Forum in the French capital. The three-day meeting usually pulls in between 2,000 and 3,000 participants from governments, the private sector, civil society and the technical community. Sessions will deal with cyber security, internet governance, human rights and emerging technologies. It also comes just days after the United Nations committee on Disarmament and International Security (also known as the First Committee) proposed two — possibly conflicting — new groups to develop rules for states on responsible cyberspace conduct. The committee approved by a vote of 109 in favour to 45 against, with 16 abstentions, a Russian draft resolution (known as L.27.Rev.1) calling on the UN General Assembly to convene in 2019 an open-ended working group acting on a consensus basis to further develop the rules, norms and principles of responsible behaviour of countries. But it also approved a U.S. draft resolution (known as L.37), with a vote of 139 in favour (including Canada) to 11 against, with 18 abstentions, asking the Secretary-General and experts to continue to study possible co-operative measures to address existing and potential threats in the sphere of information security, including norms, rules and principles of responsible behaviour of countries. As international law professor Theodore Christakis, director of the Centre for International Security and European Studies, noted in a tweet, two bodies in the UN could be moving towards different cyber processes. His tweet also said that the official UN press release describing last week’s votes is “a must read to understand dire straits of multilateral cyber security negotiations. The work by countries, tech companies like Microsoft and international agencies comes not only as criminal activity online increases but also as allegations of state-sponsored cyber attacks are ramping up. A number of countries are trying to get international consensus on Internet governance, but progress is slow. Earlier this year a conference of the Internet and Jurisdiction Policy Network hosted by Canada passed the so-called Ottawa roadmap for next year’s Policy Network meeting in Berlin. That conference, hopefully, would create policy standards and operational solutions to be presented to countries. However, the state of international consensus — or, more acurately the lack of it — is more accurately reflected in last week’s UN conference. It can also be seen in last year’s failure of a United Nations advisory body of experts to come to a consensus on what rights states have to reply to online incidents.